Open source software is becoming more prevalent in businesses today, and while still a relatively immature offering, open source enterprise resource planning (OS-ERP) systems are becoming more common. However, whether or not an OS-ERP package is the right software for a given organization is a little researched question. Building on the current real options thinking about platform acquisitions, this chapter proposes the five most critical factors to consider when evaluating an OS-ERP package. To adequately do this, a great deal of detail about the current offerings in OS-ERP software is presented, followed by a review of the real options theory and thinking behind using these factors to evaluate OS-ERP options. 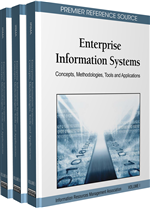 The international implications of OS-ERP are presented in the “Future Trends” section.